A safe haven could be out of reach for 9 percent of the Western Hemisphere's mammals, and as much as 40 percent in certain regions, because the animals just won't move swiftly enough to outpace climate change. For the past decade scientists have outlined new areas suitable for mammals likely to be displaced as climate change first makes their current habitat inhospitable, then unlivable. For the first time a new study considers whether mammals will actually be able to move to those new areas before they are overrun by climate change. Carrie Schloss, University of Washington research analyst in environmental and forest sciences, is lead author of the paper out online the week of May 14 in the Proceedings of the National Academy of Sciences. "We underestimate the vulnerability of mammals to climate change when we look at projections of areas with suitable climate but we don't also include the ability of mammals to move, or disperse, to the new areas," Schloss said. Indeed, more than half of the species scientists have in the past projected could expand their ranges in the face of climate change will, instead, see their ranges contract because the animals won't be able to expand into new areas fast enough, said co-author Josh Lawler, UW associate professor of environmental and forest sciences. In particular, many of the hemisphere's species of primates  including tamarins, spider monkeys, marmosets and howler monkeys, some of which are already considered threatened or endangered  will be hard-pressed to outpace climate change, as are the group of species that includes shrews and moles. Winners of the climate change race are likely to come from carnivores like coyotes and wolves, the group that includes deer and caribou, and one that includes armadillos and anteaters. The analysis looked at 493 mammals in the Western Hemisphere ranging from a moose that weighs 1,800 pounds to a shrew that weighs less than a dime. Only climate change was considered and not other factors that cause animals to disperse, such as competition from other species. 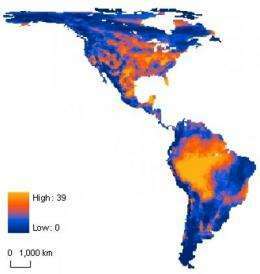 To determine how quickly species must move to new ranges to outpace climate change, UW researchers used previous work by Lawler that reveals areas with climates needed by each species, along with how fast climate change might occur based on 10 global climate models and a mid-high greenhouse gas emission scenario developed by the UN Intergovernmental Panel on Climate Change. The UW researchers coupled how swiftly a species is able to disperse across the landscape with how often its members make such a move. In this case, the scientists assumed animals dispersed once a generation. It's understandable, for example, that a mouse might not get too far because of its size. But if there are many generations born each a year, then that mouse is on the move regularly compared to a mammal that stays several years with its parents in one place before being old enough to reproduce and strike out for new territory. Western Hemisphere primates, for example, take several years before they are sexually mature. That contributes to their low-dispersal rate and is one reason they look especially vulnerable to climate change, Schloss said. Another reason is that the territory with suitable climate is expected to shrink and so to reach the new areas animals in the tropics must generally go farther than in mountainous regions, where animals can more quickly move to a different elevation and a climate that suits them. Those factors mean that nearly all the hemisphere's primates will experience severe reductions in their ranges, Schloss said, on average about 75 percent. At the same time species with high dispersal rates that face slower-paced climate change are expected to expand their ranges. "Our figures are a fairly conservative  even optimistic  view of what could happen because our approach assumes that animals always go in the direction needed to avoid climate change and at the maximum rate possible for them," Lawler said. The researchers were also conservative, he said, in taking into account human-made obstacles such as cities and crop lands that animals encounter. For the overall analysis they used a previously developed formula of "average human influence" that highlights regions where animals are likely to encounter intense human development. It doesn't take into account transit time if animals must go completely around human-dominated landscapes. "I think it's important to point out that in the past when climates have changed  between glacial and interglacial periods when species ranges contracted and expanded  the landscape wasn't covered with agricultural fields, four-lane highways and parking lots, so species could move much more freely across the landscape," Lawler said. "Conservation planners could help some species keep pace with climate change by focusing on connectivity  on linking together areas that could serve as pathways to new territories, particularly where animals will encounter human-land development," Schloss said. "For species unable to keep pace, reducing non-climate-related stressors could help make populations more resilient, but ultimately reducing emissions, and therefore reducing the pace of climate change, may be the only certain method to make sure species are able to keep pace with climate change." More information: Dispersal will limit ability of mammals to track climate change in the Western Hemisphere, by Carrie A. Schloss, Tristan A. Nunez, and Joshua J. Lawler, PNAS, 2012. Species affected by climate change: to shift or not to shift? It would be interesting to see this cross referenced to the likelihood that an animal species may be able to adapt/evolve to the changing conditions as well. I like this research, because although it was narrow and does not truly show the whole picture, it does show a realistic account of one aspect of climate change and how it relates to the animals involved. I do not like the sky is falling environmental alarmism, or the global warming deniers who can't handle that facts are indeed real. Just figure it out, show me the numbers, and I'll determine myself exactly what level of alarm I should feel. This kind of research is invaluable to having a realistic discussion on the future of the environment/biosphere. Did 9% die out when it was warmer than today during the medieval warm period and another 9% during the Roman optimal and another 9% during the......etc., etc.? It is because of silly publications like this from UW that the populace is becoming fed up with all this parasitic, alarmist AGW prattle. An example of a denier who is unable to wrap his head around all the facts. Unable to to handle the speed, permanence, and severity of man made global warming versus natural patterns. Also, there is no adequate way for us to compare loss of species or subsequent speciation that occurred during or after those temporary climate events, because no one had the means to do a full study. So not only do you assume the conditions and change were exactly the same, you also make the assumption that the results were indeed different. Mouthing off like an idiot doesn't make your opinion scientifically valid. You know, what I find bewildering is all this talk about loss of species if the temperature changes, the rain changes or the sunlight changes. Nobody ever talks about what kind of environmental stasis or changes cause new species to evolve?! The prevailing attitude today seems to be that whatever happens, we'll lose species. If that were true throughout history, we'd have none left. You seem to be saying that extinction happens at the same rate as speciation, which is almost certainly not true. I was driving on a busy four-lane highway yesterday where a fawn was frantically trying to get off a narrow median to the other side. It was harrowing and I could surmise the outcome. It was a real life illustration of what this article is about. Our own future depends on biodiversity and time IS running out. We'll need to pinch our noses closed too when the global warming deniers pull their heads out of their butts to croak the same crap. Hahaha. "Outrun" Do these guys think we're idiots? Who believes such obvious hyperbole? "based on 10 global climate models and a mid-high greenhouse gas emission scenario developed by the UN Intergovernmental Panel on Climate Change." This is all Alarmist propaganda intended for governments to ultimately gain complete and total control of the populace. All one must do is simply study the climate trends of the past, to discover that indeed, climate change has occurred, and does occur, as a normal cyclic pattern. Animals and people adapt to the changes, whether these changes occur quickly, or over time. These morons are trying to tell you that life can adapt to survive, then, they tell you that life can NOT adapt to survive. It is all aimed at people with low IQ's who do not, and can not understand the truth of the matter. As part of the process of brainwashing the entire human population, they also are engineering the lowering of IQ's by various means, such as reduced gene pool social engineering, destruction of individual familial units, etc, and so on it goes. They assume that lower IQ's of populations will result in their eventual, and complete control over, all humans. You may, and accurately I might add, assume that this sort of total control is a continuation of of the ideas of Hitler and his Nazi regime. "Ein Volk, Ein Reich, Ein Fuhrer!" I already have gained one advantage in being capable of time travel. However, this process is currently being employed only as a study and research tool to acquire knowledge. It may produce results consistent with my plans, or, it may not. If not, I shall simply return to 1885 and give up on the project, growing a garden, enjoying life, and hoping things unfold as I have observed so far (there is no certainty that they shall). got yer religion on, eh? Cause that's what you've got. Faith in something bigger 'en mo' powerful den you. 10% of species didn't die during, or after, the Lesser Dryas, which was easily the most severe climate phenomenon in the last 10,000 years. The weather's been warmer and colder than today. I'm not going to worry about warming until dairy farms return to Greenland and commercial vineyards have been operating in Scotland for 200-300 years. Why are they using the climate models when the IPCC and James Hansen declared they are all invalid last year? Besides, millions of people died during the Little Ice Age; so how many species died then? Cold is much more morbid than heat. Why must that _guy claim superior knowledge to all five official IPCC climate monitoring agencies that report global temperatures and sea level have dropped in the last several years? Why are there so many others like him who refuse to become informed, and then insult those who are informed! Other hallucinations of AGW alarmists. 1. By 1980 all important animal life in the sea will be extinct. 2. By 1985 pollution will reduce sunlight one half. 3. By 1995 the greenhouse effect will cause drought in the heartland and Eurasia and a continent wide blizzard of prairie dust. 5. By 2000 the Arctic will be ice free. "Nearly one-tenth of hemisphere's mammals unlikely to outrun climate change"